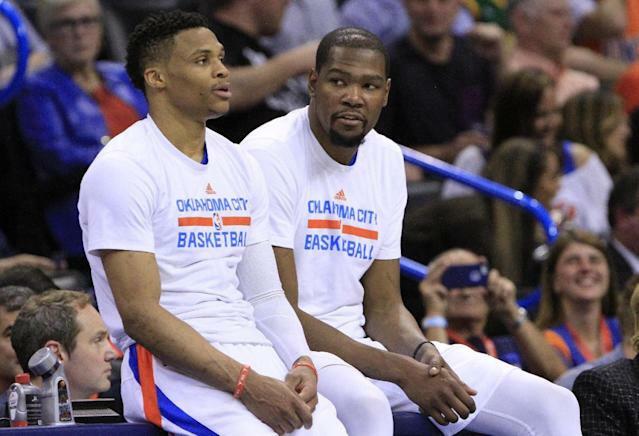 CHICAGO — Golden State Warriors star Kevin Durant refuted a report that he told his ex-Oklahoma City teammates – including Russell Westbrook – that he planned to re-sign with the Thunder. The Warriors’ projected starting five includes Stephen Curry, Thompson, Durant, Green and Zaza Pachulia – a seamless transition in Durant’s mind. Durant will enter his 10th NBA season in 2016-17, and made the decision to help lead Team USA in the Rio Olympics this summer. “Being able to represent the U.S., I know how much it means,” Durant said. “To represent your country, we have people who do it different ways. For us players, this is our way to show how much we appreciate our country and what it means to grow up on American soil. We’re a part of representing the U.S. on a global level.